Agapanthus Intermedius is a very pretty blue cut flower with multiple trumpet shaped blooms at the top of a single stem. Approx. 70cm tall & wholesaled in 10 stem wraps. Also known as the 'Lily of the Nile', (but it is not a lily), agapanthus is grown from bulb and is a genus of the Agapanthaceae family. Agapanthus are native to South Africa. 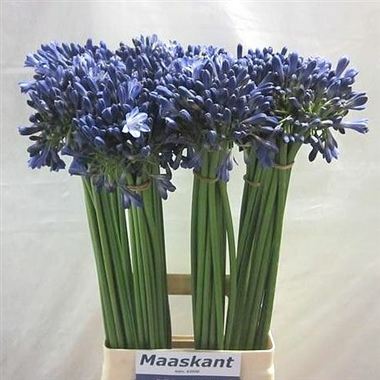 Agapanthus is a seasonal summer flower and very much in vogue for wedding flowers these days.With its globe shape mass of trumpet like flowers, agapanthus is perfect for contempory floral design.